Does anyone remember the Alfred Hitchcock movie, Torn Curtain? Or another movie, The Cross and the Switchblade, based on the book by the same name? It helps to be a Baby Boomer, but with today’s TV movie replays and DVD reproductions, you don’t have to be from the Boomer generation. 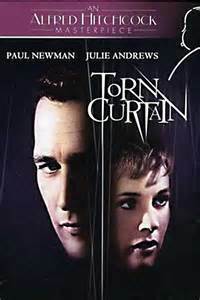 Torn Curtain was released in 1966, starring Paul Newman and Julie Andrews, two of my favorite actors. Basically, the plot was an American nuclear physicist pretending defection to East Germany, with the real objective of stealing a certain formula from East German scientists. It was set during the Cold War and the (then) existence of what was called the Iron Curtain, symbolically separating Western Democracy from Eastern Communism. But also the actual Berlin Wall built by East Germany, whose politicians pretty much took their orders from the Easter Bloc leader, Communist Russia. Later this wall would be torn down through the effort of US President Ronald Reagan. The objective was to do whatever necessary to tear down the Curtain of separation between east and west, by undermining communism in both East Germany and Russia. Eventually Communism collapsed in both East Germany and Russia … mission accomplished. The Cross and the Switchblade film was released in 1970, starring Pat Boone as Pastor David Wilkerson (who wrote the book in 1962) and Erik Estrada. This riveting true story depicted the ministry of Pastor Wilkerson among New York City street gangs, to help them turn to Jesus Christ and give up their drugs and gang violence. It is an amazing example of the life-changing Gospel of Jesus Christ. So what do these movies and especially their titles have to do with today’s Eye of Prophecy article? Answer: I’m adapting these movie titles (but also the idea behind them) to today’s article title to demonstrate the enormous juxtaposition impact the Cross of Christ had on the Jewish Mosaic Covenant (Old Testament or Old Covenant) in the first century; represented in large part by the inexplicable tearing of the Curtain (partition) that separated the Most Holy Place in the Jewish Temple from the rest of the Temple. As well as the 20th and 21st century continued significance of the New Covenant on the lives of people all over the world. Millions of true Christian believers down through the ages and in today’s world, most of whom are Gentile but tens of thousands who are (Messianic) Jews, would in unison agree that the very heart of our life-changing faith, the cornerstone of our eternal destiny in heaven is the death, burial, and resurrection of our Lord and Savior, Messiah Jesus. We fully understand that the reason Jesus came to this earth in a human body was to willingly die for our sins in order that God would forgive those transgressions—past, present, and future—and make us right with God. Then to give us the awesome privilege of direct access to the Lord while on this earth … the Holy of Holies which is God’s very presence. We fully realize that the New Covenant promised by God through the prophet Jeremiah began with the Passion of the Christ in the hours before, during, and after his agonizing beating and his excruciating pain while hanging on the Cross. In equal measure to our eternal joy and gratitude for what Jesus has done for all who believe in Him, we are saddened by so many—including millions of Jews—who still cling to the Mosaic Law or some man-made religious duties patterned after the Law of Moses as their ill-fated means to gain right standing with God. But they do so without the all-important Levitical sacrificial system that was mandated by God for (on-going, repeated) forgiveness, by covering their sin with the blood of innocent animals. In the first century, many thousands of Jews believed in Jesus as their Messiah and individually accepted him as Lord and Savior. Tragically, many more did not, especially their religious and political leaders. Consequently, as a nation, they suffered the consequences of rejecting their own Messiah when the Romans ruthlessly conquered the uprising in Israel, destroyed Jerusalem, demolished Herod’s Temple, and scattered the Jews to the four corners of the earth. Not until 1948 did this exile begin to end, and not until 1967 did the Jews regain control of all Israel, including Jerusalem. I’ve written extensively about the historical significance of the Temple’s destruction in the first century, particularly in the context of the immensely traumatic effect on the very heart and soul of the Jewish religion. If you haven’t, please read Eye of Prophecy articles, Where is the Temple? Part I, II, III (posted 11-29-14, 12-6-14, 12-13-14). Although the literal question of where is the temple rhetorically begs the all too obvious answer (it’s gone), the query is designed to provoke thought and challenge the notion that Judaism (or any religion) can even exist without the God-ordained requirement of redemptive sacrifices. The Covenant of Law consisted of two equally crucial obligations: (1) Obedience to the moral and civil laws; (2) Sacrifices of innocent (animal) blood to atone for individual and national disobedience, i.e. intentional and inadvertent transgressions. Because no one, including the priests or even the High Priest, could or did keep God’s laws and commandments without fail. The evidence is overwhelmingly clear: Ever since the loss of the Jewish Temple and the inability to continue the all-important sacrificial shedding of innocent (animal) blood, God’s people have been in mental, emotional, and spiritual denial over the dramatic dilemma of no longer keeping the daily, monthly, and especially the annual (Yom Kippur) sacrifices that included the scapegoat. Here is how I summarized it in the aforementioned series of: Where Is the Temple? “Some of his disciples began talking about the majestic stonework of the Temple and the memorial decorations on the walls. But Jesus said, ‘The time is coming when all these things will be completely demolished. Not one stone will be left on top of another!’” (Luke 21:5-6). 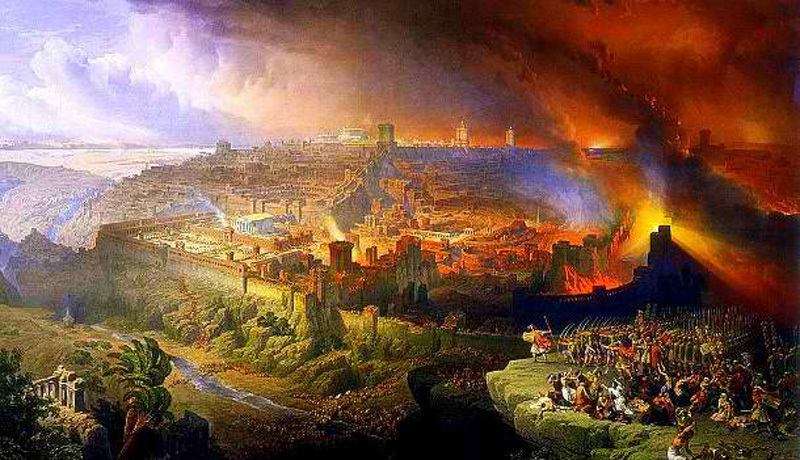 This amazing prophecy was fulfilled when the Romans sacked Jerusalem in 70 AD. Immediately following Jesus’ announcement of the Temple’s destruction, he answered his disciple’s question about the signs of the last days; which included more details on what would happen when the (Roman) armies attacked Jerusalem. And, of course, many signs of the very last days, which after some 2000 years are upon us. “Then Jesus shouted out again, and he released his spirit (died). At that moment the curtain in the sanctuary of the Temple was torn in two, from top to bottom. The earth shook, rocks split apart, and tombs opened. The bodies of many godly men and women who had died were raised from the dead. They left the cemetery after Jesus’ resurrection, went into the holy city of Jerusalem, and appeared to many people” (Matthew 27:50-53, italics for emphasis). Before we more closely examine the phenomenal, inexplicable tearing of the beautiful but very strong inner Temple curtain that separated the Holy Place from the Most Holy Place (Holy of Holies), let’s do a little refresher on what else happened when the “earth shook” while Christ was on the Cross, and also while he was still in the tomb. “The Roman officer and the other soldiers at the crucifixion were terrified by the earthquake and all that had happened. They said, ‘This man truly was the Son of God.’” (Verse 54). Can you imagine that? If you have read or have known about the toughness of Roman soldiers and their loyalty to Caesar, then their response to (even) an earthquake—let alone their recognition of Jesus as the very Son of God—is historically unimaginable. These are the same soldiers that had mercilessly beaten him, maliciously mocked him as King of the Jews with a crown of thorns and a sign on the Cross, and ruthlessly nailed him to that Cross with long spikes through his wrists and feet. Not only this execution squad of Roman soldiers, but also the incredible and less than courageous reaction of the Roman guards assigned to seal and guard Jesus’ tomb to prevent the bizarre (We don’t believe such a thing could happen but just in case) request of the Jewish leaders to Pontius Pilate that: “…you seal the tomb until the third day. This will prevent his disciples from coming and stealing his body and then telling everyone he was raised from the dead! If that happens, we’ll be worse off than we were at first” (Matthew 27:64). Pilate then issued the orders. 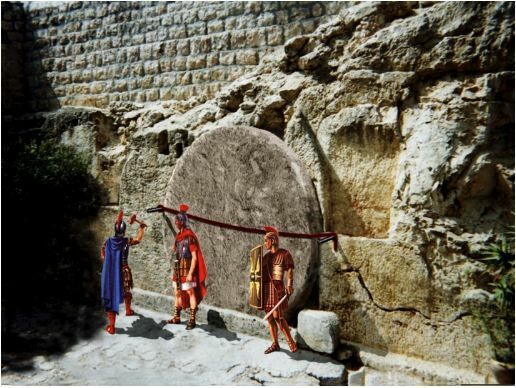 “So they sealed the tomb and posted guards to protect it” (Verse 66). Then three days later another shaking of the earth took place which caused this second contingency of normally courageous but callous Roman soldiers to quake in their boots. “Suddenly there was a great earthquake! For an angel of the Lord came down from heaven, rolled aside the stone, and sat on it. His face shone like lightning, and his clothing was as white as snow. The guards shook with fear when they saw him, and they fell into a dead faint” (Matthew 28:2-4). Even the hard-as-steel Roman soldiers were no match for an angel of God, and certainly no match for the divine supernatural resurrection of the Son of God. Moreover, they had no (truthful) explanation for such an event, nor is there any historical record whatsoever that they denied what they had seen and experienced. “Don’t be afraid … I know you are looking for Jesus, who was crucified. He isn’t here! He is risen from the dead, just as he said would happen. Come, see where his body was lying” (Matthew 28:5-6, italics for emphasis). However, the Roman soldiers didn’t tell Pilate what had happened. Although it’s unlikely that Pontius Pilate really cared at all whether Jesus’ body would be or actually was “stolen” by the disciples, the soldiers didn’t want to take a chance that they could be executed for allowing this to happen. Which was the usual penalty for a Roman sentry who allowed prisoners to escape. But this prisoner was dead! At least for three days! Surely the Roman officers would make an exception to executing soldiers who somehow (through no fault of their own) couldn’t prevent a dead man from leaving his grave? But the evidence is clear: The soldiers were too afraid; they didn’t know for sure what their fate would be. Consequently they reported the event to the Jewish elders, not to Pilate. And what did the elders do in response? About the most ludicrous thing they could do; but only because they, too, couldn’t think of anything else given the extraordinary evidence in front of them. Because they, themselves, had no reasonable rationalization or recourse to this inconceivable news that Jesus was no longer in the tomb. Although they fully realized the absurd impossibility of the disciples “stealing” Jesus’ body under the watch of the Roman Guard, their only option was to bribe the Roman soldiers into saying, “…Jesus’ disciples came during the night while we were sleeping, and they stole his body. If the governor (Pilate) hears about it, we’ll stand up for you so you won’t get in trouble. So the guards accepted the bribe and said what they were told to say…” (Matthew 28:13-15). Neither Scripture nor secular history tells us whether Pilate ever followed up on the possibility that the “disciples had stolen the body.” Undoubtedly he did find out that Jesus was no longer in the grave, but chose to do nothing about it. Ether because he didn’t care or because he had no clue what to do about angels rolling away a huge tomb stone making cowards out of his men, ending with an executed man disappearing from a tomb protected by those soldiers. To guard a dead man’s tomb in the first place was a virtually unprecedented occurrence. Not only were the Jewish leaders in denial of the horrendous results of the 2nd Temple’s destruction forty years after they called for the Roman crucifixion of Jesus—with no God-approved feasible alternative to the mandated sacrificial system given through Moses—they were equally in denial that the majestic Temple inner sanctuary curtain had been ripped in half when Jesus died on the Cross. Because the Jewish religious leaders denied that Jesus had arisen from the dead by fabricating what is probably the most lame excuse of all time (the disciples had rolled away a huge tomb stone without awaking the Roman soldiers, some of whom wouldn’t have been asleep anyway under penalty of Roman execution themselves), they certainly would have suppressed any report that this some 40-60 foot high curtain with a four to six-inch thickness could have been inexplicably torn in half from top to bottom while Jesus hung on the Cross. Jewish scholars and Rabbis, as well as Gentile critics of Scripture have pointed to the scarcity of secular or Judaic history to substantiate the Biblical account of the torn Temple curtain. Question? Does a lack of secular or Jewish religious records mean that the Biblical account didn’t happen? “I passed on to you what was most important and what had also been passed on to me. Christ died for our sins, just as the Scriptures said. 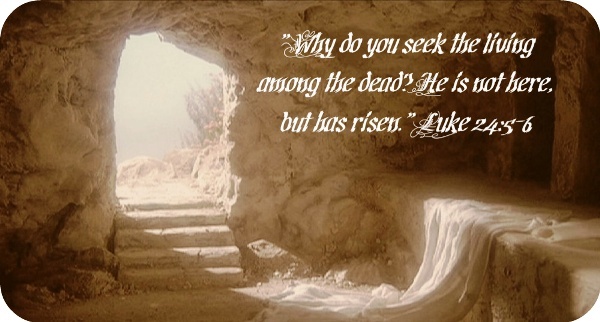 He was buried, and he was raised from the dead on the third day, just as the Scriptures said. He was seen by Peter … by more than 500 followers at one time….” (I Corinthians 15:3-6). To out of hand dismiss individual books of the Bible and Scripture as a whole as a valid historical record flies in the face of existing evidence; that there are more full or partial manuscripts of the Bible (by far) than any other document. There are thousands more of these manuscripts (such as the Dead Sea Scrolls) than the nearest number of writings (Homer’s Iliad and Odyssey), which all scholars know to be a fictional account of the Trojan Wars. Homer’s books are what we would classify as historical novels. Moreover, there have been no archeological discoveries that refute the authenticity of people, places, and events recorded in Scripture. Conversely, there have been and continue to be many archeological findings that confirm the Biblical record. As I’ve said before (paraphrased): If someone is going to deny the historicity of Jesus or any New or Old Testament books, whose authors wrote alongside of other ancient historians, then why can’t and shouldn’t they deny the validity of such historians as Tacitus, Josephus, or even more modern historians such as Arnold Toynbee? (1) The center lamp of the Temple Menorah went out on its own in an inexplicable manner, even though the priests would perform their duties by attending to the lampstand and making sure there was enough holy oil to keep each of the seven lamps burning at all times—which was required by the Mosaic Law. To the Jews, this became a sign that God’s presence was not there, or that his blessing had been withdrawn. *Note: Actually, the Jews had been in denial (it happened, but what can we do about it?) that the Shekinah presence of God had been absent since God withdrew from Solomon’s Temple, as recorded by Ezekiel even before that Temple was destroyed by the Babylonians. “Come now, let’s settle this, says the Lord. Though your sins are like scarlet, I will make them as white as snow. Though they are red like crimson, I will make them as white as wool” (Isaiah 1:18). Jesus death on the cross was the final sacrifice for all time, belief in whom/which could pardon all sins forever … changing a person’s heart and conscience from crimson stained guilt to a beautifully pure cleansing white. (3) The gates of Herod’s Temple would mysteriously open during the night, though they had been shut by the gatekeepers daily. (4) The smoke from the altar sacrifices ceased to rise upward in a tight column, which it had done for hundreds of years even during strong winds. All of these perplexing changes relating to the Temple and the Most Holy Place occurred after the resurrection of Jesus from the dead and ascension back to heaven. The Talmudic tradition unmistakably presented these events as a harbinger of coming destruction which later took place in 70 AD, less than a generation after Jesus of Nazareth predicted the utter ruin of the Temple. But it was the torn curtain of the Most Holy Place in the Temple, while Jesus still hung on the Cross, that most represented the advent of the New Covenant of Grace. A permanently new and better way to God that had replaced the Old Covenant, which was only a shadow or forerunner of redemption from sin and reconciliation with God. A removal of the barrier between a Holy God and sinful men. With, however, reference to the torn curtain of the Temple, I would add that the most important and reliable source is Scripture itself as recorded by the Apostle Matthew. In that passage quoted earlier, Matthew also tells us that the sun was completely darkened from 12:00 noon to 3:00 pm, the hour that Jesus died. That a great earthquake struck the area, and that many believers in Messiah Jesus were resurrected after Jesus first arose from the dead. Whether Jewish religious leaders in the 1st century or the 21st century cast doubt (or actually deny) that the curtain was ripped in half when Jesus died on the cross, they acknowledge in their own writings the other incidents such as the Temple gates opening on their own at night. And, of course, no one can dispute the fact that the Temple was completely demolished by the Romans which ended the Jewish sacrificial system and all Temple activities altogether. With a knee-jerk, but also ongoing, response to this solemn event in Jewish history mostly that of denial. Not that it occurred; rather that it fundamentally shook the foundation of Jewish worship and changed the very essence of atonement through the sacrificial requirements of the Levitical priesthood. Yet, as so movingly conveyed by New Testament authors inspired by the same God, Son of God, and Holy Spirit that spoke to and through the Old Testament prophets, it was all part of God’s majestic plan of salvation to the Jew first, and then to the Gentile. With virtually the entire book of Hebrews presenting a detailed contrast between the Mosaic Covenant of Law and the New Covenant of Grace. Between the flawed Old Testament priesthood and High Priest and the perfectly pure High Priest, Messiah Jesus. We’ll conclude this week’s post with one of those passages, with more to follow in next week’s Part II article. Truths that explain the awesome benefits, advantages, and everlasting superiority of the new way God has provided to make people right with him. “There were many priests under the old system, for death prevented them from remaining in office. But because Jesus lives forever, his priesthood last forever. Therefore he is able, once and forever, to save those who come to God through him. He lives forever to intercede with God on their behalf. He is the kind of high priest we need because he is holy and blameless, unstained by sin…” (Hebrews 7:23-26). The Greatest Sacrifice Ever Made, By the Highest Price Ever Paid. In Scripture, as confirmed by historical events, we see transparent evidence that God often performs miracles and gives us signs of his divine sovereignty before, during, and after he initiates a Covenant with his chosen people, the Jews, but also with all of humanity. Such as the radiate rainbow to Noah; the awesome plagues to deliver the Hebrews from Egypt then the powerful parting of the Red Sea; the Lord’s majestic appearance in the giving of the Mosaic Law on Mount Sinai and his glorious presence in the Most Holy Place of the Tabernacle and Temple; the mysterious Manna from heaven and the miraculous budding of Aaron’s staff; the inconceivable, but nevertheless Virgin Birth conception of Jesus of Nazareth, who is and will be the ultimate Messiah King descendant of David’s throne; the incredible miracles performed by Jesus; and the remarkable torn Temple Curtain … along with other supernatural events while Christ was on the cross. With the greatest miracle of all: Resurrection of Messiah Jesus from the dead! In our generation, the last day’s signs are distinctly discernible. 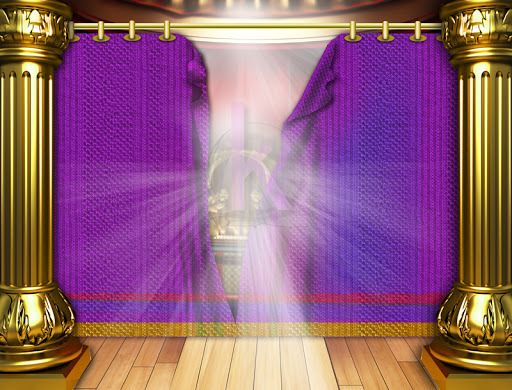 The next divine supernatural event is just around the corner.